Start your Old Town Walking Tour at the main Train Station. Walk a couple of blocks south on Werdmühlestrasse to reach the police headquarters. The Giacometti Murals cover the entrance and the vaulted ceilings of this police station. 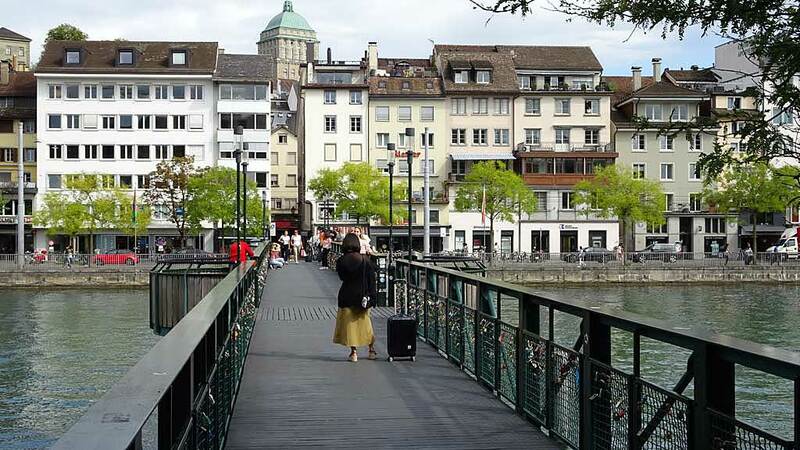 Then cross the Limmat River on the pedestrian only Mühlesteg foot bridge. Next wander the narrow streets working your way south through the Old Town along Niederdorfstrasse. 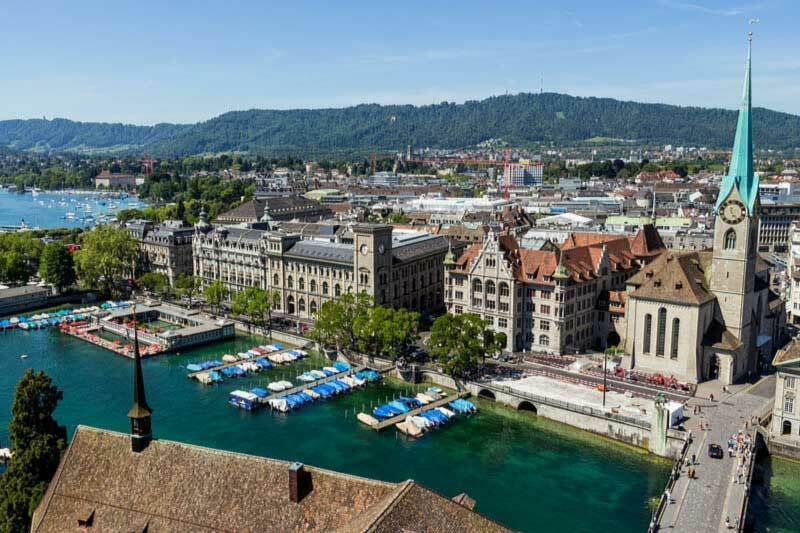 You can also choose to walk a few blocks north the the Central Plaza and catch the Polybahn funicular to the museums of the University of Zurich. The fare is included if you purchase a Zurich Card. 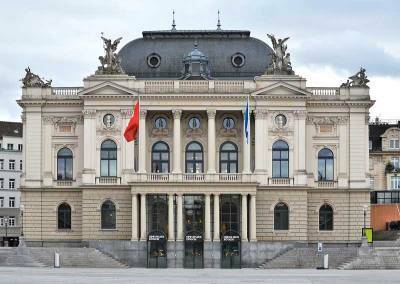 The museums at the University of Zurich include zoology, paleontology, archeology and ethnography. 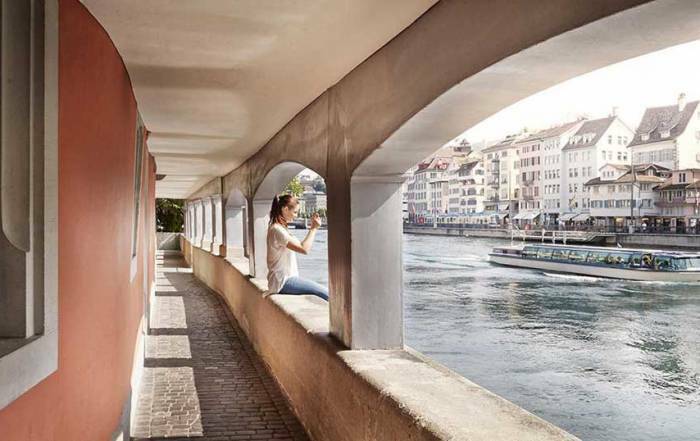 The east bank of the Limmat River in the Old Town has lots of other museums too: the Musée Visionnaire, Kunsthaus, the Zunftstadt, Haus zum Rech and Haus zum Brunnhof for example. 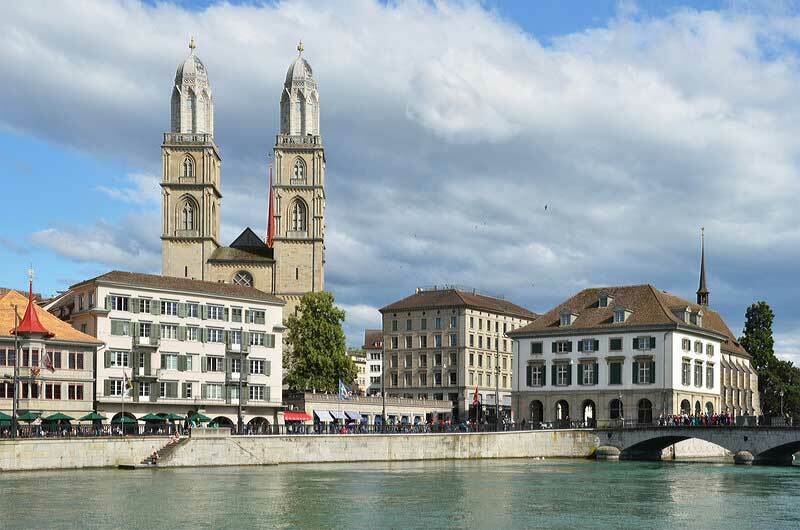 About 10 minutes south of the Mühlesteg foot bridge at the river bank is the Grossmünster Church. The church is easy to locate because of its two distinctive towers. 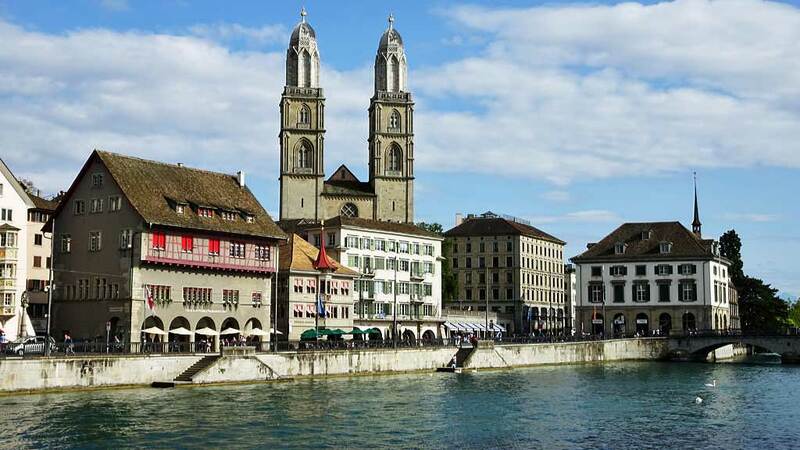 The Grossmünster was built by Charlemagne in the 1100s. Next take a side trip 10 minutes south to the Zurich Opera House. The Opera House is on Lake Zürich at the southern end of the Old Town. 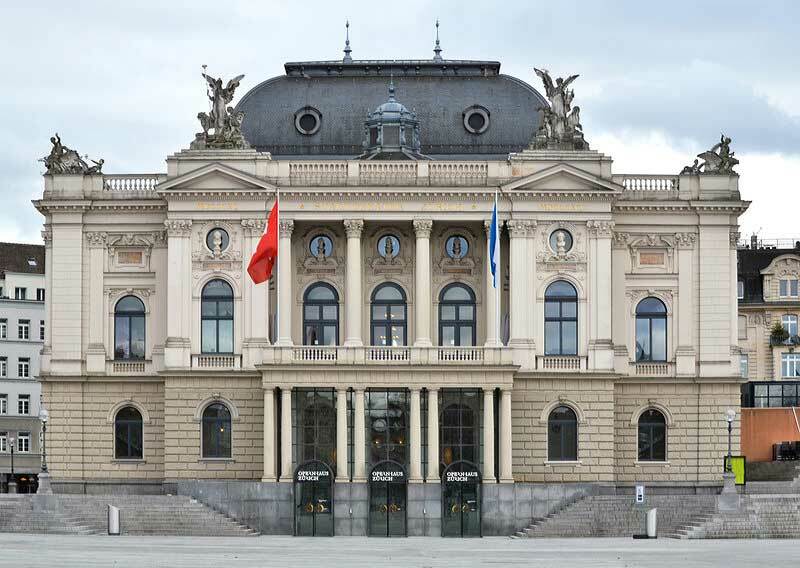 The Zurich Opera House is home to the Zurich Ballet. Next, return to the Grossmünster Church along the lakefront pathway. At the church, cross the Limmat River to the Fraumünster. The Fraumünster Church is a highlight of Zurich. 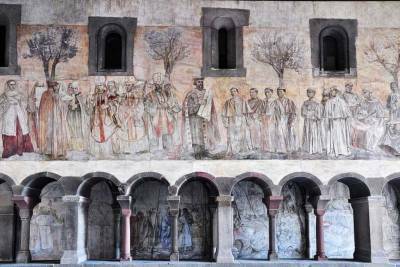 See the distinctive stained glass windows designed by Marc Chagall and the beautiful frescos by Paul Bodmer. Beside the Fraumünster is the Centralhof Monument. Then it’s only a block to the Paradeplatz, which is a square where many of the trams for Zurich intersect. You are now on the Banhofstrasse. The Bahnhofstrasse is one of the most expensive retail areas in the world. The street runs between the Train Station and Lake Zurich. 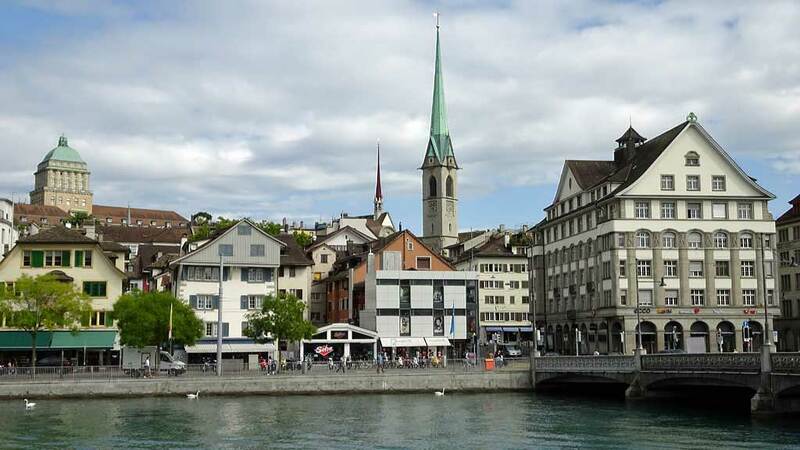 The Bahnhofstrasse runs parallel to the Zurich River through the portion of the Old Town on the west bank of the Limmat River. You can follow it all the way back to the Train Station. If you aren’t into shopping on the Bahnhofstrasse, then follow the Limmat River bank back to the train station. From the Fraumünster, walk within a block of St Peter Church on Storchengasse. Continue along this street to the Lindenhof Park viewpoint. Then take the narrow Schipfe waterfront walkway among the old shops. 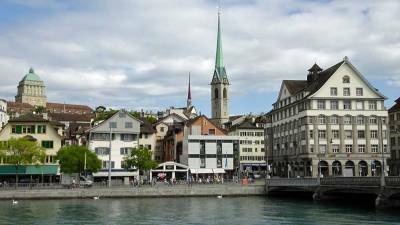 Zürich is the largest city in Switzerland. 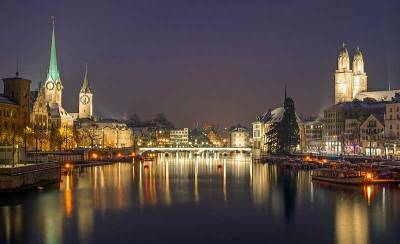 More than a million people live in Zürich. Low tax rates attract international corporations to headquarter the city. 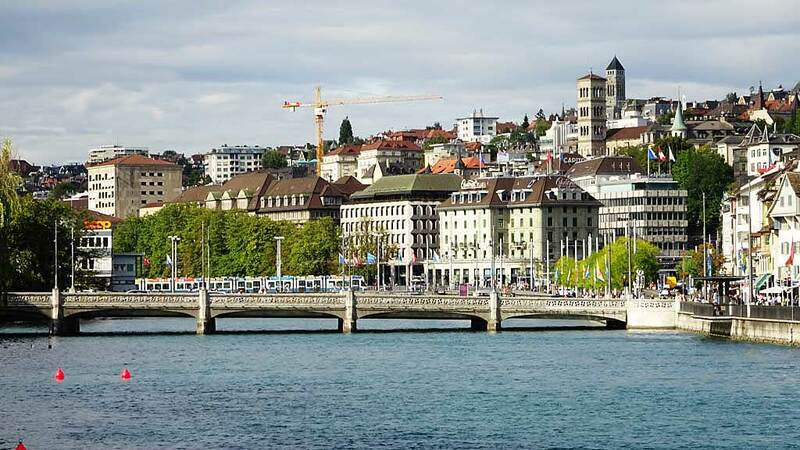 The large financial district helps Zürich enjoy a high standard of living. The wealth of the city has helped create its many museums and theaters. 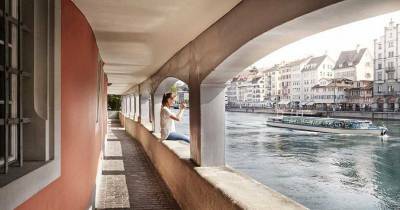 If you don’t feel up to walking the Zürich Old Town, you can take a river cruise instead. You can catch the Limmat River cruise boat a few steps from the main train station. The cruise goes under the very low bridges of the old town and finishes at Lake Zurich. The fare is inexpensive, but make sure you bring cash as credit cards aren’t accepted. 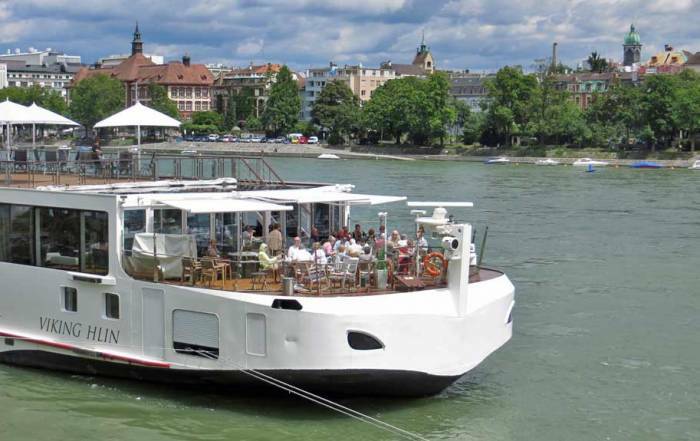 Once you reach Lake Zürich, you will also have the option to take a lake cruise too. Zürich is well known for its large number of museums. The Swiss National Museum is at the north end of the train station entrance. Behind it is the Platspitz Gardens on a tip of land jutting into the river. Other popular museums include the Rietberg Museum, the Kunsthaus Zurich, the Alter Botanical Garden & Ethnographic Museum of the University of Zürich and the FIFA World Football Museum. Visit Uetliberg mountain peak for views of the city and Lake Zürich. Take the train from the main station to Uetliberg mountain in about 20 minutes. 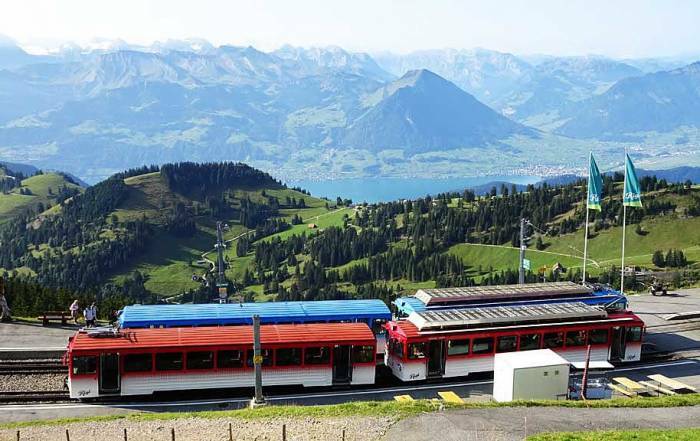 The train ride is included when you buy a Zürich Card at the Train Station. 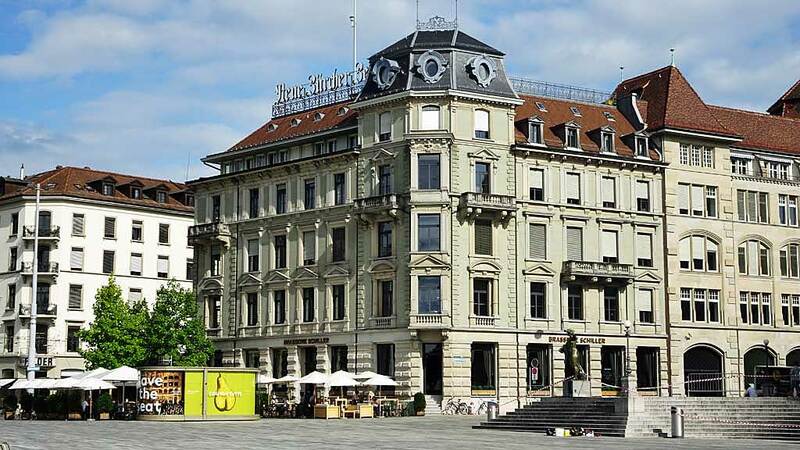 Enjoy an extensive buffet with the locals at Haus Hiltl in the Old Town on the west bank of the Limmat River. The restaurant is between Lindenhof Park viewpoint and the Bahnhofstrasse. This is one of the first vegetarian restaurants in the world, founded in 1898. If you arrive in Zürich by train, stop at Coop To Go in the main train station. You will find a great selection of picnic foods including freshly made pizza and baked goods. The Zürich International Airport is a great way to get to Zürich. The Zürich Airport is the largest in Switzerland and it’s a hub for Swiss International Air Lines (Swiss Air). 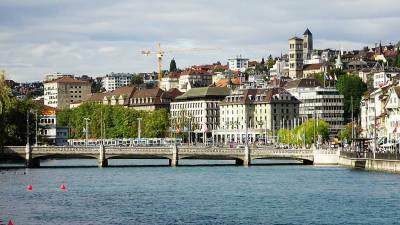 So, you will find lots of non-stop flight options to get to Zürich. Rail is another great way to get to Zürich. The Zürich Main Train Station (Hauptbahnhof) is the largest train station in Switzerland. 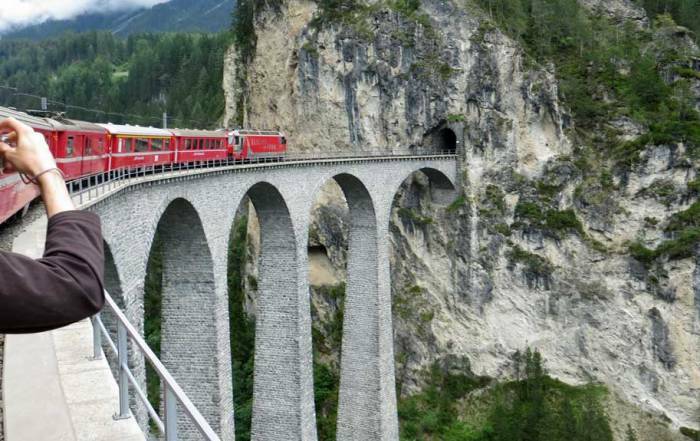 Not only is it easy to get to Zürich by rail, it’s a great choice for starting a rail tour of Switzerland. Finding a good short term hotel option in Zürich can be a challenge. AirBnB options in the Old Town can be pricey even when the units aren’t impressive. Some areas around the main train station can be noisy with traffic and night clubs. Staying near the airport adds a train commute to get to the attractions in the old town and doesn’t improve significantly on the quality of the rooms. 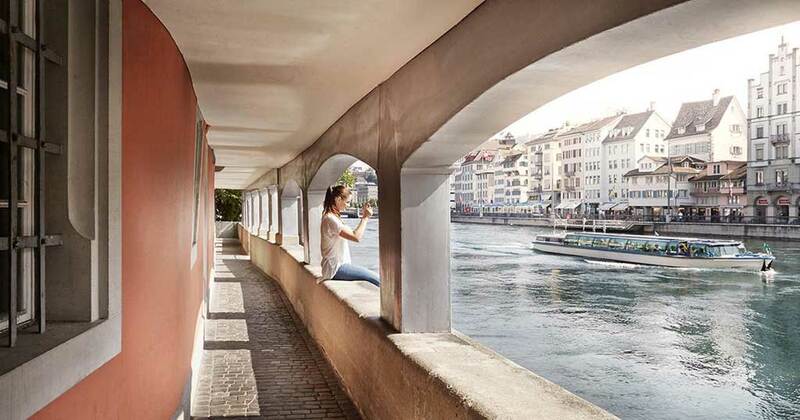 If you have suggestions for hotels in Zürich, add them in the comments below. Zürich is on the foothills north of the Alps, so Zürich weather is slightly moderated compared to towns in the Alps. July and August are the height of summer. Expect average highs of 75 F (24 C) and average lows of 55 F (13 C). 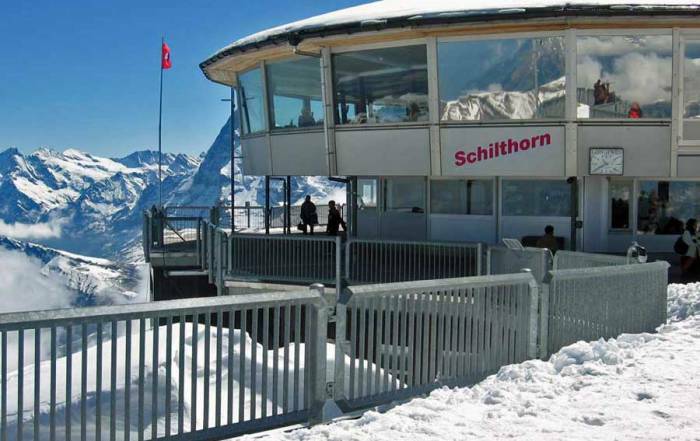 During the winter months from December – January, Zürich weather has temperatures that hover around the freezing mark. Rainfall levels are slightly higher in the summer. 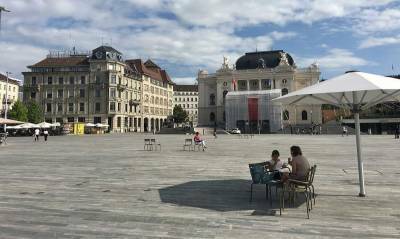 September is an excellent month to avoid the height of the summer tourist season and still enjoy comfortable Zürich weather.